Following on from the previous post, showing that most people in the UK seem to adopt the Catherine Tate approach to climate change, here are three more new surveys. A report from the University of Michigan announces that a record 73% of Americans now think that there is solid evidence of global warming. This number has soared since they started asking the question in 2008, when the figure was only 72%. A massive 60% think that it is at least partly human caused, that’s a stunning 2% up on the 2008 figure. I think many of us climate sceptics would be part of that 60%, especially when you look closely and see that that figure includes the not sures. The always-clueless Oliver Milman at the Guardian seems to be impressed by these figures. but with Cost Concerns and Muted Urgency”. Three-quarters of Americans express concern that efforts to address the issue will raise prices on things they buy and just two in 10 are very confident that those efforts in fact would reduce global warming. The latter, in particular, contributes to an absence of broad urgency on the issue. Finally, back home, there’s a new article by Nick Pidgeon, colleague of Adam Corner, at Cardiff University: Public still doubt scientific consensus on climate change. Only about one third of people in Germany, the UK, France and Norway believe that there is a strong scientific consensus on the reality of climate change, says a major survey of opinions on climate change, climate policy and future energy options among over 4,000 people across those four countries. In the comments, Geoff mentions another new survey, from Gallup, where people in the US were asked the open question “What do you think is the most important problem facing the country today?” The results showed that 2% said “Environment/Pollution”, which presumably includes climate change. Tags: news, public opinion, surveys. Bookmark the permalink. It’s one of those puzzles that scientists can continue to talk about the overwhelming consensus on climate change and yet cannot state what the consensus is. Aren’t they missing the point? The supposed controversy used to be about whether man was causing the climate to change. Talk of extreme weather events is just misdirection, to obscure the fact that CO2 increases have failed to correlate with temperature trends in the way they (IPCC) used to confidently predict. The framing strategies that you draw attention to in your article are part of a broader application of behavioural psychology to encourage the public into supporting a treasured policy. Using surveys to manipulate the public, and using framing techniques to manipulate the surveys, forms part of the cognitive game. CAGW sceptics are often accused of being conspiracy theorists but this is quite uncalled for. There is no need for us to suspect covert intrigue – the manipulation actually takes place in broad daylight! In fact, those that are responsible for such antics go out of their way to advertise their presence and what they are doing. It is all laid out in gory detail in Chapter 2 of AR5 for all to see. Note also that the UK Committee on Climate Change is proud to have a professor of behavioural science (Nick Chater) on the team to apply his ‘behavioural insights’ into ‘public policy and business’. I don’t think the likes of Nick Chater see their manipulation as a necessary evil. Instead, they think they are using their very clever insights to rescue the public from their cognitive imprisonment – not to manipulate the public into supporting the noble cause would be the true evil. John, so it is Psyops applied to domestic civilian populations. 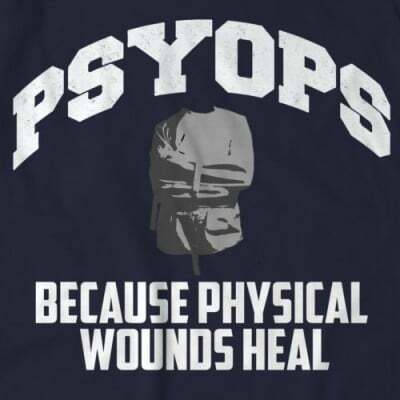 You may wish to call it psyops, but the behavioural scientists cited by AR5, Chapter 2, prefer far more innocuous terminology. People who openly talk of framing, in the context of “the design of decision aids”, and increasing “the attention given to climate change in the spirit of social amplification of risk”, are hardly keeping their guile under wraps. It’s almost as if they are confident that sceptics never bother to read what the IPCC writes. 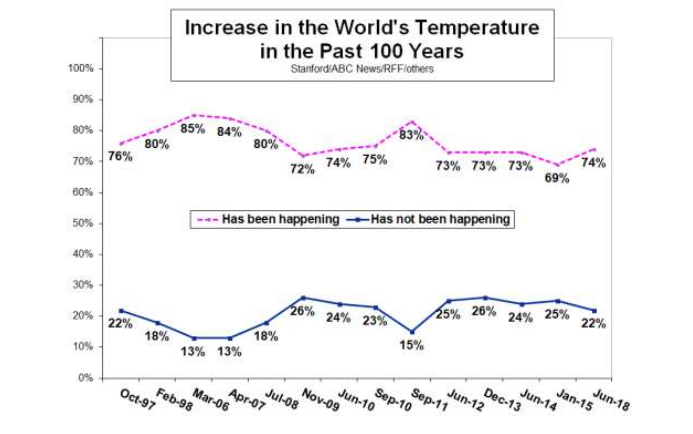 So 73% of Americans now think that there is solid evidence of global warming, up from 72% in 2008. Survey questions are like jokes; what matters is how you ask/tell them. Gallup’s questions were open-ended, which means that respondents were free to say what they liked, and they therefore reflect what people are thinking about, rather than what the pollsters are asking them to think about. Out of 47 possible responses recorded, only two scored more than 10%, namely Immigration/Illegal aliens at 22% (up from 8% in January) and Dissatisfaction with government/Poor leadership at 19% (down from 25% in January.) So the recent images of the treatment of immigrants at The US’s southern border seem to have acted in Trump’s favour, which I don’t find surprising. The 1% of Americans bothered by Environment/Pollution no doubt include a large proportion concerned by problems other than climate, often local, as for example the destruction of ancient forests to provide wood chips for Britain’s 15th century energy system. I think it’s safe to say that less than half a percent of informants are bothered about the climate, about the same number who are bothered about Russia, ISIS or Gay Rights. I’m not sure if that’s strictly true. Presumably the people at Gallup put answers into categories, and would have filed ‘climate change’ under ‘evironment/pollution’. The kind of open-ended question asked in the Gallup poll is fairly useless when the subject is as vast and complex as “problems facing the world.” Among the <1% worried about the “Situation with Russia” there are no doubt some who worry about Trump provoking a nuclear war, and others who fear that he's soft on Putin and won't go to war. Watching CNN, you'd think 99% of Americans think Trump's conversation with Putin was the most dangerous event of the century. For this reason alone, polls can be a handy corrective. The advantage of the polls that Paul mentions in the article is that they ask the same question over time. This allows one to spot trends, even if the question is poorly formulated. Journalists tend to interpret the results as hard facts – numbers of people who believe – whereas what's being measured is surely something much more intangible – a Cloud of Unknowing rather than belief in a dogma. It would be interesting to measure trends in the number of books published on climate change (and their sales figures.) My impression is that this would show a peak of interest around 2009 and Copenhagen, and a steep drop since. Expressions of concern nowadays (except from the well-funded professionals) feel like a distant echo of something half-forgotten, like the smell of incense given off by the ponytailed beardoes in secondhand vinyl disc shops. Roger Pielke Jr, always worth listening to, has something to say about this issue, in 4 tweets (WordPress seems to like grouping them in pairs), referring to a different Gallup poll. Polarization works great for those opposed to action, who surely have fueled the deep politicization of climate. But at some point those wanting action need to admit that what they've been doing isn't working, and may be counterproductive, and change course. The above numbers also show how ineffective the gloom/doom climate communicators have been, and will continue to be. Folks sense the exaggeration and hype, and turn off/don’t believe the highly political/apocalyptic messages. That is why I spend a lot of time dealing with the hypsters (like some comm Seattle Stranger, and “activist” scientists like Michael Mann) and work hard to produce a fact-based climate message. It is the only way one can earn trust. Folks won’t sacrifice if they don’t trust your information. (a) The alarmists could point to clear prophesies that had come true. (b) They were prepared to have their arguments on the same basis as those of the critics. People can smell bias when name-calling those with different points of view. (c) For the genuine experts to put clear water between themselves from the crazy political activists.